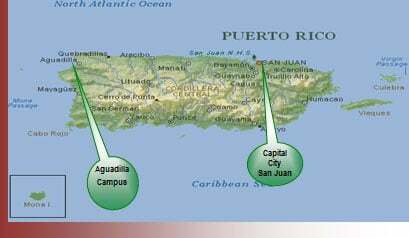 The Aguadilla Campus was founded in 1957 as an extension of the San German Campus. It is located in the northwest region of the island, 81 miles from the San Juan metropolitan area. In 1969, the Campus became part of the Regional College Administration System of Inter American University. 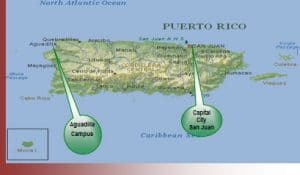 In 1986, a decentralization process began at the University System Level, resulting in the designation of Aguadilla as a Campus in January 1992. The Campus serves 10 municipalities with an estimated population of 437,315. In 1992, the Campus submitted its first Self Study Report for accreditation and has been reaccredited since. One hundred thirty nine administrative employees are distributed as followed: 61 in academic (67.2% female), 47 in administration (31.9% female), and 31 in the students’ area (83.7% female). One percent of the employees holds a doctorate, 38.1% Masters, 48.2% hold bachelors, 3.6% have associate degrees and 14.4% have high school diplomas or less. During the past decade, full time faculty members have remained stable, from 74 to 79 members. Tenure and rank distributions have improved slightly. The number of tenured professors grew from 67% to 80%, while the percentages of Associate Professors experienced a 1.38% growth and the number of full professors doubled. Currently, seven faculty members are taking courses leading to doctoral degrees. The Campus has five academic departments and the full-time faculty teaches over 62% of courses that are offered. The Aguadilla Mission was revised in 2011 to include Distance Education. During the past decade, 31 new academic programs were authorized and several are in the process, waiting for approval from the Puerto Rico Council of Education (DEPR). The reorganization of the Department of Education and Social Sciences was necessary to strengthen the Teacher Education Program. Courses from the Humanistic Studies Department were moved to the Department of Education to create the new Department of Education and Humanistic Studies. Social Science courses that used to be part of the Department of Education and Social Sciences were transferred to the newly created Behavioral and Social Sciences Department. Natural Sciences laboratories have been remodeled, and new equipment has been added to the Campus academic facilities. Transferring the Nursing Program to a more spacious location was necessary to give more space to our students and faculty. The change allowed us to create the Health Science Department that is composed of Nursing and two new programs, Radiology and Pharmacy. The Campus received the accreditation of the National League of Nursing in 2009. The Campus Learning Center (CLC) that was funded through a Title V Grant has been institutionalized and has been an asset for student assessment and learning. The role of the Information and Telecommunications Department has changed over time from a faculty and students training center to a maintenance and technical support center. Its personnel continue to take care of the telecommunication infrastructure, hardware selection, and the administration of the Campus’ computer network. Upgrades are made periodically and computers are replaced as the Campus moves forward as the leading Institution in the region. Aguadilla achieved revenue projections during the past years, although enrollment varies from semester to semester. The Campus has fulfilled all its financial obligations during the past 10 years and has improved services at all levels. Automation has maintained integrity and control in budget management and fund disbursement. It has helped simplify administrative procedures and has allowed University officials to get rapid access to information. Facilities improvements included improvement of indoor and outdoor lighting, installation of air conditioning units in all classrooms, and the acquisition of high power generators to avoid labor interruption. The Aguadilla Campus is also in the process of remodeling a structure to transfer the culinary program and plans are underway to build a new student center. Campus personnel are aware that providing excellent student services is the key to succeeding in a competitive environment, therefore they has placed considerable efforts in developing activities and programs that are relevant to today’s university students. Improvements in technology provided the necessary tools for the automation of the admissions and the enrollment processes. Students are now able to perform most of their academic activities through the Internet. The University’s system network BANNER, has helped improve current administrative and academic processes, and enabled the Institution to collect important data for follow-up purposes. The Aguadilla Campus has a moderate adult student population. A fourth of the student body is registered in AVANCE, the University’s main adult program. AVANCE provides opportunities for students who otherwise would not have been able to pursue their academic goals. Schedule innovations allowing students to advance quickly in their academic program were received quite favorably. Furthermore, the Campus has developed its distance education program to give more alternatives to students who are not able to enroll in a regular program. Counseling services are organized based on student enrollment by academic programs. The Campus understands that a closer link between the academic departments, the faculty, and the counselors contribute to the welfare of our students. Having faculty and counselors working together is benefiting students and providing counseling interventions especially to those with academic and personal difficulties. Aguadilla students continue to be heavily dependent on financial aid. Every year, the Campus grants various types of financial assistance to more than 93% of the students. Online inscription for Pell Grants has reduced significantly the waiting period for granting students financial assistance. In most cases, students receive responses to their grant or loan applications in less than a week. The Campus has made a significant effort to place itself at the cutting edge of technology through the improvement of its technological infrastructure. Now, online education personnel provide training on the use Blackboard and other teaching tools to full and part-time faculty. Inter American University at Aguadilla is proud of its accomplishments during these past ten years. It has evolved successfully from a centrally controlled branch campus to a semi-autonomous one while maintaining a respected place in the academic community, both in the region and on the island. As the Campus moves forward, we are confident that our continuing efforts will renew the pace of academic and technological leadership exhibited in the past. During the next ten years, a new phase will begin in the quest for excellence and service in higher education. Our academic programs will continue to improve and our graduates will continue to be successful. We are confident that the Aguadilla Campus has and will continue to be a place of learning and a beacon for those who look for directions and will continue to respond to the needs of its constituents. From the onset of the self-study process, we decided to incorporate four members of the Assessment team into the Steering Committee. Campus officials understood that both teams, working together, would broaden the interactions, would clarify doubts, and would provide a better understanding of the issues our Campus is facing. The contribution that the assessment team has made to the self-study process has allowed us to review our accomplishments, to address our shortcomings, to plan for tomorrow, and to continue to strive to provide better services to those who depend on us. Looking back at the experience, the interaction was useful and meaningful for both teams. They were able to deepen their understanding about each other’s work and provide more support to the subcommittees. The analysis and ideas that came about from the self-study committee have helped us redefine some of our priorities and to rethink some of the decisions that were made. We understand that, as the result of this process, we have matured and are more focused on the issues that are put forward in this document and that will continue to be our goals for the future.